The Israeli Republic, the first English edition of Iranian iconoclast Jalal Al-e Ahmad's 1963 travelogue of his visit to Israel, has been attracting attention and stoking controversy since its release from Restless Books. You can read an excerpt of the book with a new introduction in Foreign Affairs and listen to a radio feature from PRI's The World, which describes Al-e Ahmad as "Iran's Hemingway." Restless Executive Editor Joshua Ellison had a conversation with translator and author Samuel Thrope about the book. Based in Jerusalem, Thrope is the curator of the Persian collection for the National Library of Israel. JE: Tell us a little about how you came to discover Jalal Al-e Ahmad's work and this book in particular? What about it made you want to delve more deeply? ST: It's funny: I knew about Jalal Al-e Ahmad even before I knew that I knew about him—that's part of the fate, I think, of immersing oneself in a second language and culture. You only realize later how much you were taught at the beginning, and how much you didn't understand. I first discovered Al-e Ahmad and The Israeli Republic—consciously at least—listening to a lecture by Eldad Pardo at Tel Aviv University. I had only recently come to live in Israel, after living in the country on and off for about ten years. Listening to this lecture on Al-e Ahmad was like a revelation; and I immediately got hold of a copy of the book and started translating. It was only later, as I delved more deeply into Al-e Ahmad's writing and life, and began reading his other books, that I realized that I had studied him years before in a Persian literature class. Al-e Ahmad's journey to Israel captured my attention not only because I was so excited (admittedly, naively) by an Iranian writer who had a "positive" view of Israel, but also by the fact that he portrays his visit as the realization of a long held dream. He had studied Israel from afar, and had finally managed to come and see it from up close. I—and feel—the same way about Iran, a country I have studied for so long, and which I can't yet visit. I identified with his character, his curiosity, his longing and adventurousness. Help us understand who Al-e Ahmad was—in the context of his time and place. What role did he play in Iranian political and cultural life? In the nineteen-sixties, and even more so after his death in 1969, in the decade leading up to the Islamic Revolution, Al-e Ahmad's influence was enormous. He was already well known as a fiction writer and sometimes literary critic in the nineteen-fifties, but his later social and cultural writings brought him much wider recognition. Al-e Ahmad articulated the anger, fear, and uncertainty of the Iran of his day. Most of his fame, though, came not because of the cogency of his arguments or the sharpness of his conclusions—Al-e Ahmad was always more of a feeler than a thinker, and if you really try to pin him down, even on a signature issue like Iranian society's relation to Western culture, the topic of his most influential essay Occidentosis, you don't come up with very much. What, precisely, was he arguing for? Its not really very clear. Hamid Dabashi, in his book Theology of Discontent, on the Islamic intellectuals who laid the groundwork for the Islamic Revolution, has a chapter on Al-e Ahmad. In Dabashi's description, Al-e Ahmad is more a celebrity, or a saint, who articulated the frustrations and longings of a generation, a very important generation, of young Iranian students and activists, than a clear-eyed and methodical thinker. The fact that he didn't have articulated solutions was unimportant, and maybe even to his advantage. "Read your Al-e Ahmad and you were in," Dabashi writes. “A generation of political fantasy spoke his words, regurgitated his ideas, quoted his passages, came to intellectual puberty with his essays, travelogues, and short stories…By the time you took your university entrance examination…you better have your minimum dose of Al-e Ahmad or else." Al-e Ahmad's encounter with Israel, as he himself tells it, came about in the wake of a split in the Iranian Communist party, the Tudeh party, in 1948, when Al-e Ahmad was in his twenties. He and others began looking for non-Stalinist and non-Soviet models for socialism, and it was in the course of that searching that they discovered the kibbutz. These Israeli agricultural cooperatives seemed an ideal alternative for the Soviet collective farm, the kolkhoz. Over the next fifteen years, before he himself traveled to Israel, Al-e Ahmad read widely from Israeli books and magazines -- whatever he could get in Tehran — as well as the Bible, Jewish history, the transcripts of the Nuremberg trials, etc. Now, that is what he tells us in The Israeli Republic. But from other evidence, in particular his letters from this period, we know that he was in close contact with members of the Israeli diplomatic mission in Tehran. These connections are what made possible Al-e Ahmad and other like-minded intellectuals' journeys to Israel. This is not as surprising as it might sound. In the nineteen-sixties, under Shah Mohammad Reza Pahlavi, Israel and Iran had close, if unofficial, ties. Military, intelligence, and economic cooperation was the closest, but there were also cultural contacts. Israeli diplomats were part, though obviously not at the center, of Al-e Ahmad's social circle of writers, artists, and intellectuals, both before and after his trip to Israel. While researching this book I had the chance to look through documents from the Israeli embassy in Tehran, kept in the Israel State Archives. One of the most interesting facts that these documents reveal is that Al-e Ahmad was consulted about other Iranians' plans for Israeli-Iranian cultural cooperation. The documents present him as an advisor and confidant, not only as a "contact" or person of diplomatic interest. As for what Al-e Ahmad was looking to find in Israel, there were a number of attractions: he was looking for an alternative model for Iranian society, for socialism, and for a place where his own internal conflicts could be resolved. But his first motive, and that's the place where its easiest to identify with him, is simply to see from up close this country that he had observed for so long from afar. His desire to see for himself, in other words his curiosity, is what makes this book so surprising, and make it more than a political tract. Curiosity is always personal and always idiosyncratic, and it his relentless curiosity that drove Al-e Ahmad to Israel and, as it were, through it, on to the next enthusiasm. The book appears to careen from infatuation with Israel to disappointment to disgust. What did he find so discouraging? What changed in him, or in the world around him? Nothing can live up to an ideal, can it? I think that Israel, in his eyes, was a utopia, at least for a time, and perhaps never unreservedly. The Israeli Republic is the result of his idealization of Israel confronting the reality of a state. No real, flawed political entity can live up to a utopia. There are also larger trends of which The Israeli Republic is a part. In the late nineteen-sixties, Iranian intellectuals and political opponents as a whole were identifying more and more with revolutionary struggles and independence movements in Africa, Latin America, and elsewhere in the Third World. As the Shah's government became less democratic and took on more of the trappings of authoritarianism, left-leaning intellectuals like Al-e Ahmad saw similarities between their situation and that of people fighting against colonialism. It's a paradigm shift. In The Israeli Republic, this shift is most evident in the changing presentation of an Arab country like Egypt at the beginning of the book and at its end. In the beginning, Egypt is portrayed as a hypocritical country, espousing socialism and claiming leadership of the Islamic world but really pandering to the West. In the final chapter, Egyptian are part of a larger Muslim fraternity and a fellow Third World nation facing off against Western colonialism in the guise of its Israeli proxies. The last chapter, which is by far the most vitriolic, still leaves room for ambiguity. His anti-Zionist screed is presented as a "friend's letter from Paris," to which he added his own "nonsense and beard pulling." There is also a theory that the chapter was added posthumously, by his brother. In your best conjecture, how would you describe Al-e Ahmad's feelings toward Israel and Zionism at the end of this life? That last chapter is very different. I don't want to dodge the question of its authenticity, but I think it is just impossible to answer without serious research in Al-e Ahmad's papers and journals, and perhaps even then we can never know. Al-e Ahmad was working on this book, and other travelogues, when he died suddenly in 1969; he was, apparently, planning to publish the notes from his trips to the United States, the Soviet Union, Europe, and Israel in a single volume called "The Four Kabas"—the Kaba is the sacred black stone in Mecca towards which Muslims pray and which is the object of the Hajj pilgrimage. All this is to say that Israel was still very much on his mind, and that he had not rejected it entirely. However, the 1967 Six-Day was a turning point in Al-e Ahmad and other intellectuals' conception of Israel—and not only, of course, in Iran. Israel transformed from this besieged, socialist enclave surrounded by hostile Arab states to a conquering, imperialist power. This last chapter is, as you say, ambiguous, and I think that Al-e Ahmad is speaking through the voice of a character, not straightforwardly voicing his own opinions. However, I think it also represents a real change in Al-e Ahmad's conception of the Jewish State. He is no longer idealizing, no longer enthralled by Israel as a model for Iran. I mean, it certainly says something that he doesn't even take the trouble to speak in his own voice. What do you consider to be some of Al-e Ahmad's keenest insights into the Israeli psyche and political reality? What were his most glaring blind spots? We have to remember that, for all the reading Al-e Ahmad might have done, and for all the connections he made with Israeli diplomats, his visit to Israel only lasted two weeks. How much can you learn about a country in two weeks? Especially when you don't speak the language. He was reliant on his Israeli interpreter—who, at least from the evidence of the book, spoke French and not Persian, so we have a kind of double translation—and followed the itinerary laid out for him by the Israeli foreign ministry. It's not surprising, from this perspective, that he gets so much wrong: does he think Israel is a guardianship state, a velayat, because he is consciously making a provocative metaphor, or because he doesn't really understand how the Israeli government works? Its probably a little of both, and there are other mistakes and exaggerations along similar lines. What is most glaringly wrong, though, are the book's omissions. First of all, Iran's own longstanding and venerable Jewish community is mentioned only in passing in The Israeli Republic. Al-e Ahmad does not discuss meeting Persian-speaking Jews in Israel, or Iranian Jews' involvement in the Zionist movement. Moreover, as much as Al-e Ahmad portrays Israel's leaders as righteous guardians, in the Islamic sense, Judaism as such also doesn't have much presence in The Israeli Republic. Israel today is a much more overtly religious place than it was in the nineteen-sixties, but the absence of any discussion of Judaism, Jewish belief, or even a synagogue in the Jewish State is striking. I think these absences are not accidental. Al-e Ahmad, in a certain sense, needed Israel to be a blank slate. It is essential to remember that, like many other travel writers, in writing about Israel Al-e Ahmad is also claiming it for himself. In your essay, you describe Al-e Ahmad’s predilection for grand ideological projects that often ended in disillusionment. Tell us about some of the causes and ideas that captivated and ultimately failed him. Is there anything consistent among them: a core conviction, a first principle, that birthed all the others? His wife, Simin Daneshvar, wrote a great essay called "My Husband, Jalal," in which she identifies restlessness, or adventurousness, as one of his main qualities. Al-e Ahmad was born and grew up in a religious, clerical family, and even studied for a time in a seminary in Najaf, one of the Shia centers in Iraq. He rejected religion as a young man and became a Tudeh party Communist. He rejected Communism to become a social democrat, then rejected politics entirely. He sought an ideal, unspoiled Iran in the country's villages, and wrote a few detailed anthropological studies of village customs, before he abandoned that project. He took up painting. He was enthralled with Israel and Zionism until he returned to Islam, though in his own idiosyncratic, non-practicing way. Al-e Ahmad wrote primarily about himself, even in fiction. In this sense, Al-e Ahmad is really an essayist, in the tradition of Montaigne. He returns again and again to his internal landscape, and as with Montaigne, that landscape is shifting and inconstant. 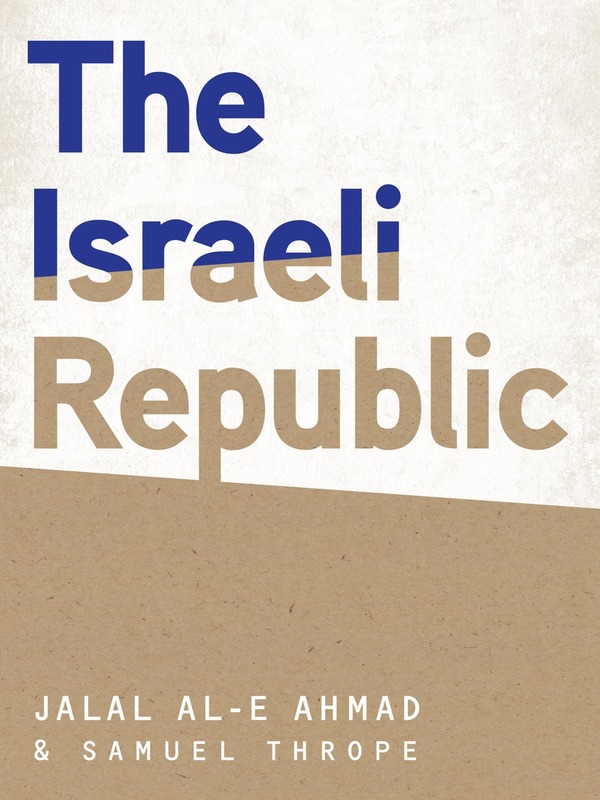 The Israeli Republic is a good example of this essayistic style: the book is told in the first person, as a series of experiences and insights, in which ambiguities and contradictions are left to stand, with no attempt at closure. Ideologically, I think the common factor in all his shifting enthusiasms was that Al-e Ahmad was essentially conservative. This might seem contradictory, since he was active for so long on the left, but he was no radical. Look at Occidentosis, his best-known cultural essay: he argues that Iran's traditional culture must be preserved against the West. That's a conservative argument. And with that traditional culture comes a traditional social order. Al-e Ahmad's perspective on women, for instance, is entirely patriarchal—that is how he relates to his own wife Simin Daneshvar, and how he relates to women in general. This man was not a feminist. You've given Al-e Ahmad a unique voice in English: sometimes erudite and longwinded, sometime blunt and colloquial. Tell us a bit about how, as a translator, you approached his prose style. It’s a good question. Al-e Ahmad's prose is notorious because it is deceptively simple: he writes in a spare style, with very short, clipped sentences, and sometimes even leaves out the verb. It is on this account that he has been sometimes called the Iranian Hemingway. He passes through a number of different registers: didactic and personal, high and low. My main challenge was to retain his staccato, punctuated voice in English and make it intelligible to readers not conversant in Al-e Ahmad's world of allusions. What does Al-e Ahmad have to teach us today about the conflict between Israel and Iran? I think the more important lesson of The Israeli Republic is that it shows how similar Israel and Iran actually are. The book is about an Iranian, conflicted about his place between East and West, coming to a place where he hopes he can find a resolution to that conflict, but which, it turns out, is just as conflicted as he is. Its no accident that Al-e Ahmad sees something he recognizes in Israel. Eastern European Jews and Iranians were responding, in some similar ways and around the same time, to the same radical shocks in their traditional cultures: modernity, secularism, all these ideas originating in Western Europe. The fact that Al-e Ahmad came to Israel, and that fact that he wrote about it as he did, demonstrates that the conflict between Israel and Iran, even an Islamic Iran, is not inevitable. Al-e Ahmad reminds Israelis that it was not so long ago that everything was different. I don't think that Israel's cooperation with the Shah is something that we should venerate today—Israel was selling arms to a dictator and training SAVAK, the secret police. But it is good to remember that Iran is not a country populated by foaming-at-the mouth anti-Semites bent on Jewish destruction, as some Israelis seem to believe.